Tom Trento, Heidi Mund, Alexandra Belaire, Andre Drouin. 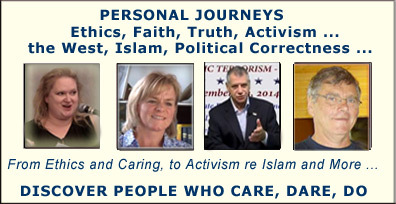 Interviews with 4 more amazing fighters for freedom of thought and speech, for the truth about political correctness and multiculturalism, the truth about Islam, and about the dangers the West is facing. Monday Nov 3 - Thursday Nov 6, 2014. To listen, register here (if you are not already registered). Tom Trento, of The United West, a major online and "real world" media presence. A recent show asks: CAIR and La Cosa Nostra - Birds of a Feather? 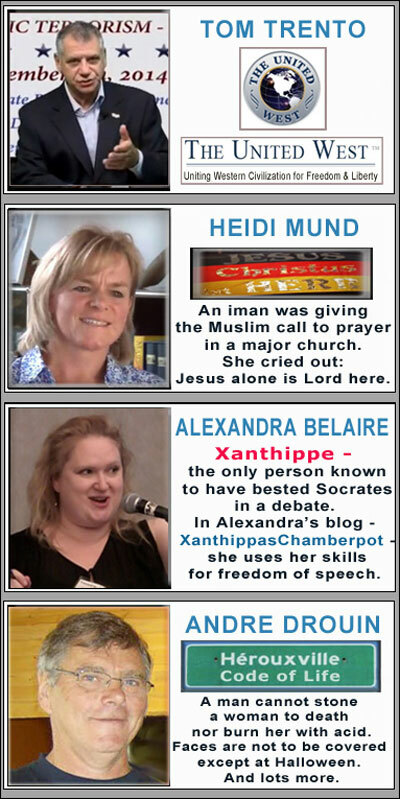 Alexandra Belaire, atheist blogger for freedom of thought and speech. Her most recent focus: the many court cases against Connie and Marc Fournier of Free Dominion, the oldest Canadian Conservative discussion forum - now shut down. The interviews will go online, one a day, Monday to Thursday, Nov 306, 2014, and will be available at no charge for 2 days. And who is putting all this together? Yes, it's me - the truth sleuth. I care about Western freedoms and values, and am very aware of the dangers posed by Islam and the politically correct. political correctness, facts about Islam. to the home page, click here.